As I posted recently, I had modified my Voodoo Telecaster to add out of phase switching. For the second push/pull pot I had been considering the “Arlo Cocked Wah” modification. 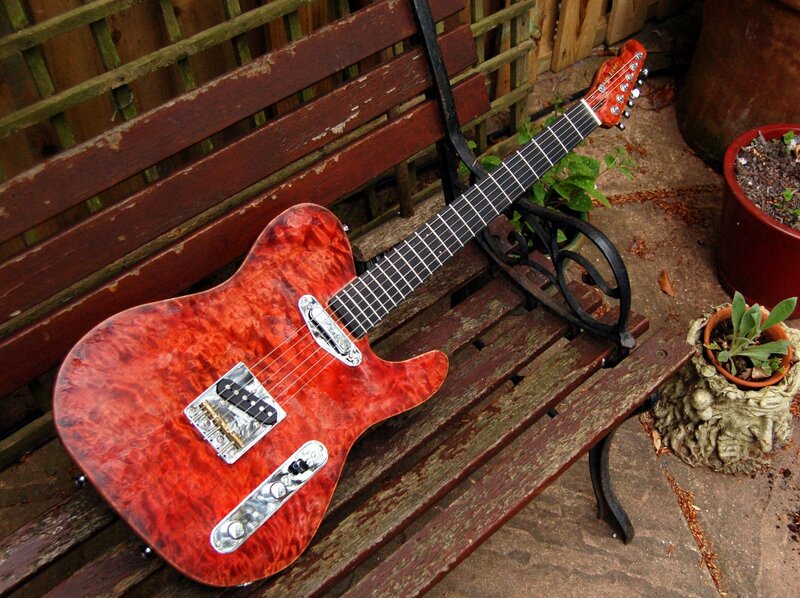 Alfie on the SixStringBliss forum had suggested that using the tone on a Tele can give a good honky sound. Playing around with this I stumbled on something… with the middle selector switch (bridge and neck selected) and the two pickups out of phase, this takes a lot of the bass out of the signal. If I roll down the tone control on the guitar this cuts the top end, leaving just a very honking middle sound – hey presto – cocked wah! Recorded into Reaper using Amplitube’s Orange Tiny Terror model. As I posted previously, I’ve added “out of phase” switching to my Voodoo Telecaster and I thought it would be worth sharing the exact details of how I did that. 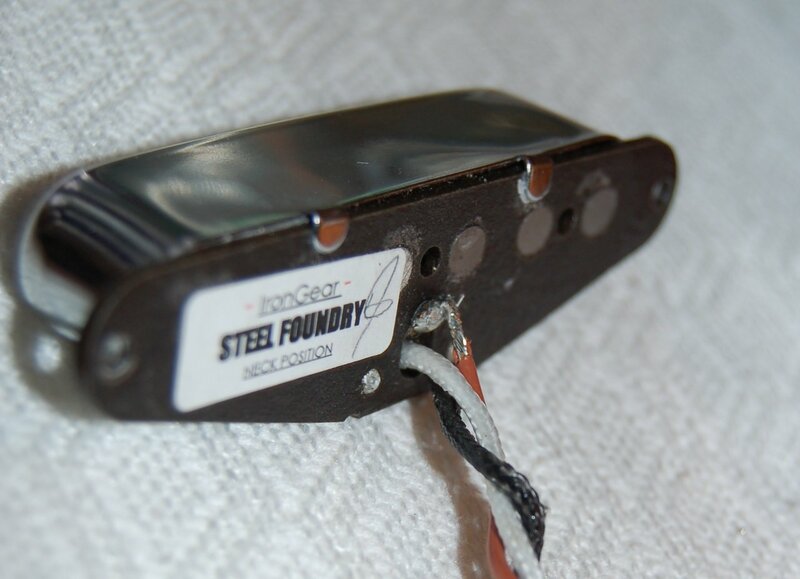 The Telecaster neck pickup has a very simple construction. There are two leads coming from it. The hot is connected to one end of the coil. The ground is connected to the other end of the coil and the pickup cover. 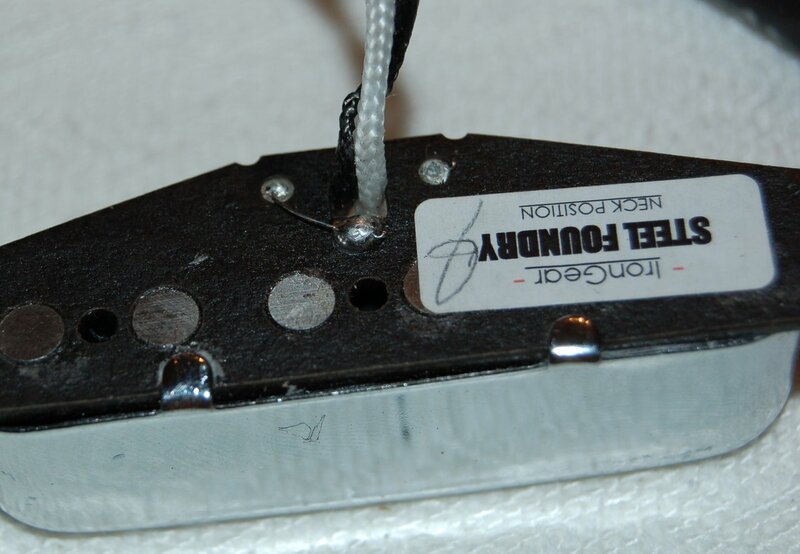 If you were to just add a switch to invert the phase of the pickup it would mean that the pickup cover would also get switched to be the hot signal and we don’t want that. This means we need to modify the neck pickup slightly. 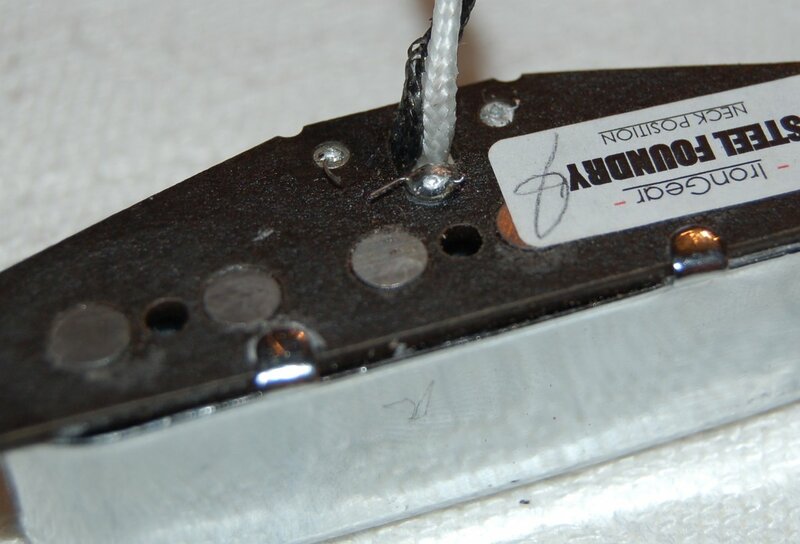 If you look at the underside of the pickup, you’ll see a small jumper wire that connects the cover (lower centre) to one end of the coil and the black ground lead (left). First we need to break that connection. A simple snip of the wire does it. Then we need to solder on a separate ground lead. In this case I used a brown wire, just so that when I get to the tangle of wires in the control cavity, I can easily identify it. Once we get to the control cavity, the brown lead gets soldered to one of the common ground points (I used the back of the volume pot). The two remaining leads from the neck pickup go to the two centre poles of a DPDT switch (double pole, double throw). Like this. Let’s talk through how this works… If the switch is in the “up” position (the top pair of poles are connected to the centre poles) then one end of the pickup coil (hot) enters at the right side, is connected by the switch to the top right pole and therefore connects to ground. 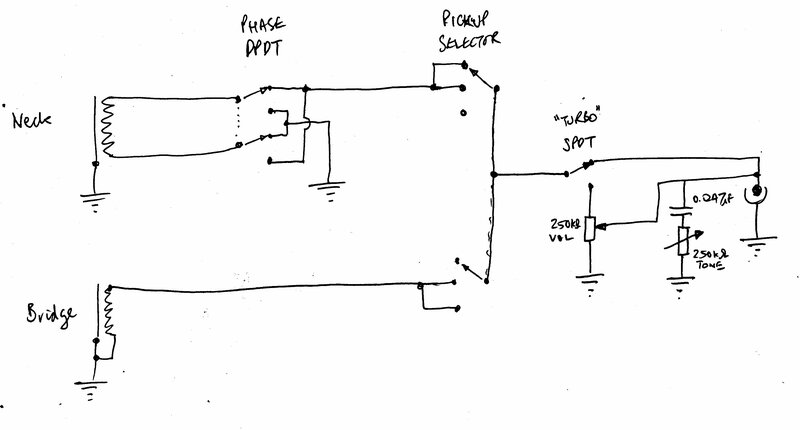 The other end of the pickup coil (labelled ground in this picture) enters at the left, is connected to the top left by the switch and therefore connects to the hot going into the selector switch. Push the switch into the “down” position and the exact opposite is happens. Hey presto phase reversal. The sound produced is not going to be to everyone’s tastes. It is a very thin twangy sound (think strat position 2 with the bass on your amp turned way down). I love it for reggae/funk style rhythm guitar and it really cuts through a mix well. Here is a quick test of the four pickup combinations; neck, neck and bridge in phase, bridge, neck and bridge out of phase. In each case it is a simple E major pentatonic running from open low E through three octaves. Recorded using a Fender Bassman sim on a Line 6 Pod XT Live straight into Reaper.